There will be a day when one of my sons will test the veracity of Numbers 32:23. “Be sure your sin will find you out.” I’ll tell him the story of Hunting Eichmann, a book full of spies and Nazi hunters and kidnappings and justice. Who’s to blame for the holocaust, for the sixty-four pound bodies, and the 60,000 living skeletons? Whose deeds made General Omar Bradley speechless and caused George Patton to vomit against the wall? Whose atrocities drove Goebbels, his wife and six children to commit suicide? Who plundered Jewish property through terror and torture? Who denied enslaved Jews their rights as human beings? Who promised these same Jewish prisoners that they had nothing to worry about? Among others, it was Adolf Eichmann. What set him apart was that when most of the notorious Nazis fell into Allied hands within the first weeks of occupation, Eichmann managed to escape. As the head of the Jewish branch of the Gestapo hired to rid Europe of Jews by extermination, he eluded justice for nearly two decades. World War II Germany had fancy titles for wicked deeds just like America does today. We call the organization that helps slaughter millions of innocent children ‘Planned Parenthood.’ They called the concept of annihilating the Jewish race the ‘Final Solution.’ Adolph Eichmann was the German version of Margaret Sanger and Cecile Richards. Eichmann fled to Argentina and had a family but he was never happy–always looking over his shoulder as he worked a dead-end job. The book centers around the exploits of the Mossad, Israel’s young intelligence agency. They were to capture Eichmann, smuggle him back into Israel, and place him on trial. This they did and the trial was covered around the world. It ended with the first—and to this day only—sentence of death by an Israeli court. This book was much like Unbroken in that—despite the author—the sheer grandeur of the story kept the pages turning. Bascomb does not write with exceptional wit or insight. He was only quotable when quoting someone else. But the story yields several lessons. Your sin will find you out. 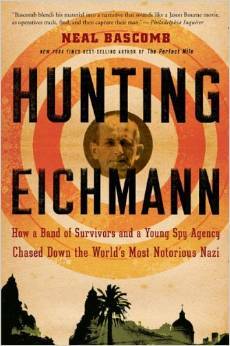 For Eichmann, his sin was found by the Jews over fifteen years later. For my daughter, it may be by his mother the next day. For you, it may not be until the last day. “[Jesus] will bring to light those things now hidden in darkness” (1 Cor. 4:5). Appearance can be deceptive. The man who looked like a postal clerk, someone so average in temperament and appearance, was responsible for the extermination of six million Jews. The personification of evil worked 8-5 and had a family. Review: What is the Mission of the Church? I enjoyed this book. Here’s a whirlwind summary of the ten chapters. (1) The mission of the church is the Great Commission (i.e. making disciples, preaching the gospel). “Mission” is hard to define because it is not a biblical word and it is so broad. Don’t use “ought” for so many kinds of ministries. (2) Several of the most common social justice texts (e.g. Lk. 4:16-21) don’t stand up to scrutiny. The Great Commission is so important because it is a command, the NT has more weight than the OT, it contains Jesus’ final words and it sums up the gospel. “Missions” takes “mission” one step further. (3) The gospel. (4) Wide and narrow focus on the gospel. (5) An already, not yet, George Ladd-like explanation of the kingdom. (6) A lengthy discussion on the 12 most common social justice passages: Lev. 19:9-18 (love and be generous but oppression doesn’t equal inequality), Year of Jubilee (this was given to a Jewish, agrarian society under the Mosaic covenant), Isaiah 1 (oppression is sinful, not inequality), Isaiah 58 (we should help the poor), Jeremiah 22 (kings should judge fairly and not exploit), Amos 5 (do not excessively tax), Micah 6:8 (don’t steal, bribe or cheat), Matt. 25:31-46 (care for God’s messengers and you’ll be caring for Christ), Luke 10 (don’t love according to race or gender), Luke 16 (don’t love money more than Jesus), 2 Cor. 8-9 (voluntarily be generous with the poor), James 1,2,5 (don’t show favoritism but treat the poor with dignity. (7) Seven modest proposals on social justice. 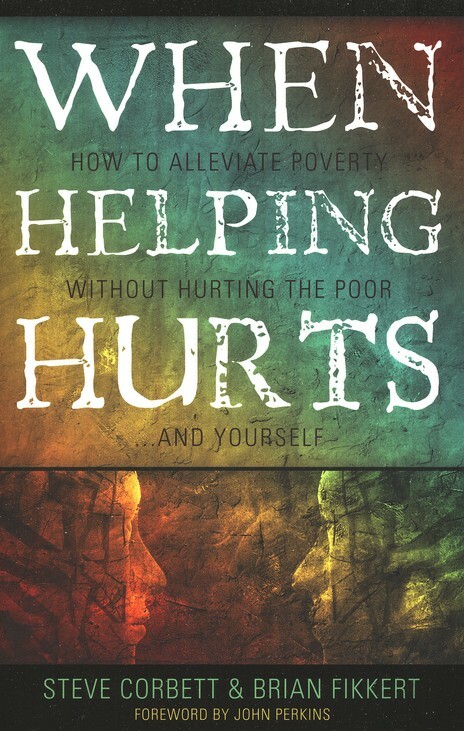 Help the poor but focus on Christians. A theology of money is complex. “Social justice” is nebulous. The closer the need the greater moral obligation. Capitalism is good. (8) Shalom. (9) There are many good reasons for doing good, such as love, obedience, the gospel and character. (10) The mission of the church is the Great Commission. The worst thing in the world is not poverty, contrary to common belief. DeYoung is relentlessly biblical—something somewhat unexpected from a young evangelical. If nothing else they successfully hammer home the point that social ministry is secondary because if the church does not plant, nurture and establish new churches, no one else will. Some of their assertions made me pause and consider and nod and shake. These would be good discussion points around the kitchen table. Is it true that we must be on guard against the counterfeit gospels of affluence and asceticism? (264). This book left me feeling short sheeted, as did Israel after putting false hope in the Egyptians (Isa. 28:20). Erwin Lutzer said some good things, as when he laid out the three-step game plan of the homosexual movement: speak of gays loudly, portray gays as victims, and solicit funds from big corporations. His quote of leading gay activists is frightening: “Almost any behavior begins to look normal if you are exposed to it enough” (21). I only wondered why they included the word “almost”. 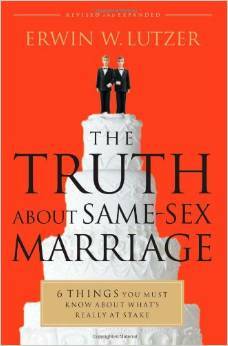 Overall, Lutzer’s arguments were less than winsome. There were too many stats and surveys and not enough Scripture and verve. Someone has said that the besetting sin of Evangelicals is niceness. This book was nice. Lutzer implies all sins are the same in God’s sight. He continues. “This is no time for self-righteous finger-pointing” (16) and “we must lower our voices in this debate, speaking with respect and dignity” (17). This is partly true; all sins grieve our Lord and break his law (James 2:10). But not all sins are the same. Some will be judged more severely on the final day (Mt. 10:15). If we can say that God was more outraged over child sacrifice to Molech than he was toward gossip (Jer. 32:35), why can’t we say God is more outraged over homosexuality than materialism (Rom. 1)? The reason is because we live in an age of equality, meaning all things—even sins—must be created equal. There were other lines that creased my eyebrows. “There is nothing wrong with a boy being effeminate” (109). In contrast, Paul said unmanly men will not get their prayers heard (1 Pt. 3:7). He implies that the “such were some of you” line in 1 Corinthians 6:11 does not mean that unbelieving homosexuals will be transformed into believing heterosexuals but instead into chaste homosexuals (90-92), as though leaving the act of homosexuality is the only goal. I wonder if he would agree that even homosexual lusts are sinful as well (Matt. 5:28)? But surely this command is not as simple as it appears. The verse just prior says that because Christ lovingly laid down his life for us, “we ought to lay down our lives for our brothers.” Should we give our life for our uncle dying of cancer, the suicidal man who is jumping off the bridge, or the Aussie who is on death row? Doesn’t it mean, rather, that should the occasion present itself, Christians must follow Christ’s ultimate example of love by being willing to lay down our lives as well? In the same way, just as there are many occasions when it would actually be sinful to lay down our lives for our brothers, it would also be sinful to give to the poor in an improper way (e.g. he refuses to work, Gal. 6:10). Moreover, there are a number of other observations in this verse to consider. The verse speaks about “brothers”, not the world in general. The verse specifically forbids deliberately ignoring our brothers who is in legitimate need when we have the means to do so. Yes. Help this poor man. But this is a far cry from a mandate to help single moms in Uganda. Which brings us to the matter of why this person is poor. The answer determines how we give. If he refuses to work, he shouldn’t even be given food to sustain life (2 Thess. 3:10). Scripture gives many causes of poverty, such as laziness (Prov. 10:4; 20:4, 13; 24:30-34), pride (Prov. 13:18), and an over interest in get-rich-quick schemes (Prov. 12:11). The authors give some attention to this (ch. 4) but ignore many distinctions, choosing rather to speak of poverty without distinction, which the Bible certainly does not do. It is a healthy exercise to address not only the strengths in other cultures but also the weaknesses. If we agree that the gospel is not only able to transport our souls to heaven but also change everything about us, including the way we do business, family, education, and work, then we must also acknowledge that some cultures have had a greater influx of gospel intrusion within their culture than others. If the culture of Scotland was not superior to the culture of the cannibals on the New Hebrides when John Paton first landed there, then the gospel doesn’t mean much. Of course the Scottish culture was superior and we mustn’t be afraid to point this out. Christians must temper this with humility, prayer, and Scriptural warrant, but the deed itself is noble. For example, suppose there is a godly Christian professor from the mountains of India who takes his wife and children to visit the US. As they sit in the JFK airport, they discuss the books they read on the plane and the goals they have for the trip. Then he calls his family’s attention to the American culture around them. “Do you see the families hardly speak to each other? He’s glued to the TV. She’s attached to her device. The 35 year-old over there has been playing video games for an hour. Rotten my children.” Who would fault such a scathing yet accurate critique of our culture? Who would deny this is healthy for his family? The authors cannot bring themselves to point out the weaknesses in poor, foreign cultures. At one point they observe the different ways people view time. The monochronic view—which could just as easily be called the biblical view—“sees time as a limited and valuable resource.” This would be most Western nations. Where I minister, there is such a thing as “African Time” and anyone who has lived or worked in Africa knows about this. It is common for pastors to give the starting time of church an hour before it starts so that people will arrive on time. But how do the authors define the alternative view: the polychronic view means tasks typically take a backseat to forming and deepening relationships.” Right. Can’t we acknowledge that actions take so long in the third world because time is not valuable? Weekly, I have church members slither into church an hour or two late. I guarantee they were not digging deep into their mother’s family tree. They over slept. They weren’t watching. Time is limitless. That is a weakness and we should call it such. There are weaknesses in every culture, some more than others depending on how aligned that culture is with Scripture. It is not judgmental or racist to point these out. The authors assume that STM trips will be social in nature and they rarely even mention evangelism or other gospel work. They then say, “[the STM trip] is not about us. It is about them!” (172) If the trip is social in nature, I agree. But what if the primary purpose in taking a one month trip to Senegal is to (1) see if you are compatible with the mission team (2) see if you are deft at picking up the language (3) see if the spiritual needs fit your goals (4) see if you are gifted to minister in that area. All of these goals are self-centered in a sense. Churches should keep a watchful eye on gifted young men and push them to STM trips with these goals in mind. 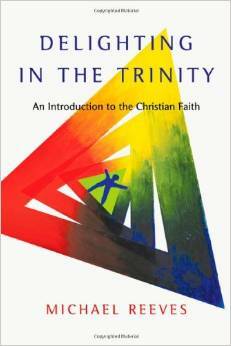 Delighting in the Trinity gives an introduction to the Christian faith through the lens of the triune God. Michael Reeves draws heavily from church history—with generous quotes from the Puritans, Jonathan Edwards, Luther, and Calvin. To show the importance of the Trinity, he quotes the Athanasian Creed that says whoever does not hold to the Trinity will “perish everlastingly”. Imagine that being said from the pulpit today. Reeves is cheeky and witty but not so as to forget the Scriptures. The Christian life could not exist without the triune God, he says, and then gives some examples. Only the triune God (as opposed to Allah) can inherently love, for apart from the Godhead there would be no one for God to love (Jn. 17:24) before the world began. Only the triune God can atone for sinners, for if there were no sinless Son sinners would have to atone for themselves. Prosperity theology is the most common expression of Christianity in sub-Saharan Africa. Prosperity theology is not Christian. Therefore, sub-Saharan Africa’s Christianity is actually not biblical Christianity. The sons of Sceva have reached our continent in the form of Benny Hinn, Creflo Dollar, Fredrick Price, Joel Osteen, and TB Joshua. I was thrilled, then, when I saw the heading “Repenting of the Health and Wealth Gospel.” Finally, something I’ll agree with. But in the end, the authors define the PG not as the false notion that Jesus came to earth to make us healthy and wealthy, not as the promise to heal us of all our diseases, but rather as the failure of genuine (yet wealthy) believers to trust God in everything (68-70). This, friends, is the prosperity gospel.